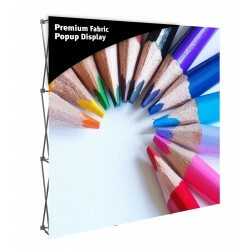 Formulate Essentials Curved Banner 36 Displays are basic aluminum tube frames covered in pillowcase fabric graphics. Formulate Essentials Curved Banner 36 has a total graphic area of 36.25" x 94.5". Formulate Essentials Curved Banner Displays are basic aluminum tube frames covered in slip-over pillowcase fabric graphics. 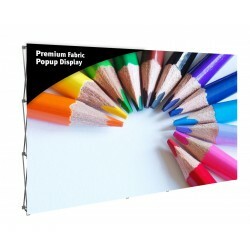 This entry level graphic banner display features rounded corners and bungee cord connected frame sections that connect with snap button assembly so the entire display can be quickly assembled without tools. This also makes the displays easy to store and inexpensive to ship. 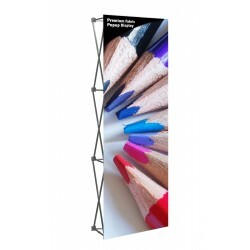 The vertical curve shape is an eye catching alternative to flat banner stands and adds dimension to your message . The pillowcase graphics are dye-sublimated in-house using the latest printing technology to provide rich, vibrant color images that are durable and can be washed. These graphics are printed and hand-sewn in-house to ensure the highest quality and proper fit. 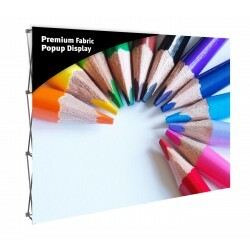 The Formulate Essentials Curved Banner 36 tension fabric display has a total graphic area of 36.25" x 94.5". It comes complete with the frame, pillowcase fabric graphic, and canvas carry bag. The Small Molded Shipping Case is the recommended shipping case for this display. 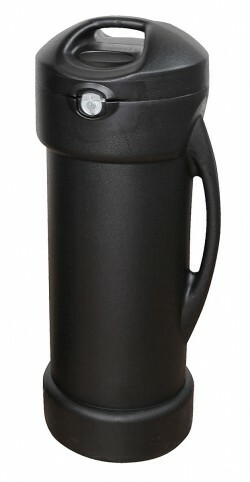 It can be ordered from the Related Products tab. Graphic size: 36.25" x 94.5"